Dorzolamide (trade name Trusopt) is a carbonic anhydrase inhibitor. It is an anti-glaucoma agent, and acts by decreasing the production of aqueous humour. It is administered as a topical ophthalmic in the form of a 2% solution. 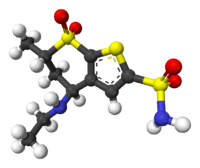 This drug, developed by Merck, was the first drug in human therapy (market introduction 1995) which resulted from structure-based drug design. It was developed to circumvent the systemic side effects of acetazolamide which has to be taken orally. Dorzolamide hydrochloride is used to lower increased intraocular pressure in open-angle glaucoma and ocular hypertension. It lowers IOP by about 20%. Ocular stinging, burning, itching and bitter taste. It causes shallowing of the anterior chamber and leads to transient myopia. 1 2 3 4 KD Tripari MD. Essentials of Medical Pharmacology (5th ed.). Jaypee Brothers Medical Publishers(P) Ltd. p. 88. ISBN 81-8061-187-6. Kubinyi H (1999). "Chance favors the prepared mind--from serendipity to rational drug design". J Recept Signal Transduct Res. 19 (1–4): 15–39. doi:10.3109/10799899909036635. PMID 10071748. Plummer C, MacKay E, Gelatt K (2006). "Comparison of the effects of topical administration of a fixed combination of dorzolamide-timolol to monotherapy with timolol or dorzolamide on IOP, pupil size, and heart rate in glaucomatous dogs". Vet Ophthalmol. 9 (4): 245–9. doi:10.1111/j.1463-5224.2006.00469.x. PMID 16771760. Grover S, Apushkin M, Fishman G (2006). "Topical dorzolamide for the treatment of cystoid macular edema in patients with retinitis pigmentosa". Am J Ophthalmol. 141 (5): 850–8. doi:10.1016/j.ajo.2005.12.030. PMID 16546110. Almeida G, Faria e Souza S (2006). "Effect of topical dorzolamide on rabbit central corneal thickness". Braz J Med Biol Res. 39 (2): 277–81. doi:10.1590/S0100-879X2006000200015. PMID 16470316.